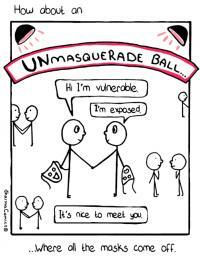 Vulnerability isn't good or bad: it's not what we call a dark emotion, nor is it always a light, positive experience. Vulnerability is the core of all emotions and feelings. To feel is to be vulnerable. To believe vulnerability is weakness is to believe that feeling is weakness. To foreclose on our emotional life out of a fear that the costs will be too high is to walk away from the very thing that gives purpose and meaning to living. Our rejection of vulnerability often stems from our associating it with dark emotions like fear, shame, grief, sadness, and disappointment—emotions that we don't want to discuss, even when they profoundly affect the way we live, love, work, and even lead. What most of us fail to understand and what took me a decade of research to learn is that vulnerability is also the cradle of the emotions and experiences that we crave. We want deeper and more meaningful spiritual lives. Vulnerability is the birthplace of love, belonging, joy, courage, and creativity. It is the source of hope, empathy, accountability and authenticity. If we want greater clarity in our purpose or deeper or more meaningful spiritual lives, vulnerability is the path. I know this is hard to believe, especially when we've spent our lives thinking that vulnerability and weakness are synonymous, but it's true. I define vulnerability as uncertainty, risk, and emotional exposure. With that definition in mind, let's think about love. [...] Love is uncertain. It's incredibly risky. And loving someone leaves us emotionally exposed. Yes, it's scary, and yes, we're open to being hurt, but can you imagine your life without loving or being loved. To put our art, our writing, our photography, our ideas out into the world with no assurance of acceptance or appreciation—that's also vulnerability. To let ourselves sink into the joyful moments of our lives even though we know that they are fleeting, even though the world tells us not to be too happy lest we invite disaster—that's an intense form of vulnerability. The profound danger is that, as noted above, we start to think of feeling as weakness. With the exception of anger (which is a secondary emotion, one that only serves as a socially acceptable mask for many of the more difficult underlying emotions we feel), we're losing our tolerance for emotion and hence for vulnerability. It starts to make sense that we dismiss vulnerability as weakness only when we realize that we've confused feeling with failing and emotions with liabilities. If we want to reclaim the essential emotional part of our lives and reignite our passion and purpose, we have to learn how to own and engage with our vulnerability and how to feel the emotions that come with it. For some of us, it's new learning, and for others it's relearning. Either way, the research taught me that the best place to start is with defining, recognizing, and understanding vulnerability. Excerpted from Brene Brown's book ​Daring Greatly: How the Courage to Be Vulnerable Transforms the Way We Live, Love, Parent, and Lead. Seed questions for reflection: How do you relate to the notion that vulnerability is the path to deeper or more meaningful spiritual lives? Can you share a personal experience of a gift of learning that came from allowing yourself to be vulnerable? What helps you to allow yourself to engage with vulnerability? Pretty good post. I am definitely enjoying your website. You definitely have some great insight and great stories. I agree with the observation that vulnerability is a condition of being. I suggest that we can choose to be consciously or mindfully vulnerable or we can choose, often by default, to be threatened or overwhelmed by vulnerability. One approach moves from love and abundance, the other from fear and scarcity. I know that there are times when I am in fear and need, and so vulnerability can feel like weakness. There are ever more times when I am in my heart which I have opened to another, and I experience vulnerability as a great strength for I have learned through practice that it is in vulnerability that I connect most deeply with others, with spiritual meaning, and with this amazing universe and our beautiful planet. Sometimes when I show people the drawings I've done I feel quite nervous. I have to breathe a little deeper in those moments. I've decided that the more nervous I feel, the more vulnerable I feel, and that it's actually a good thing. It means to me that there's probably something I really care about there in that picture I've created. So I try to hang tight and stay open while I feel so vulnerable, even knowing that I might get criticized. In those moments it does seem like a risk! yet so far I have survived, and I believe my art smiles every time I do it. The author says to feel is to be vulnerable. I believe that to be is to be vulnerable. Everything, living and not living, is vulnerable, that is, hurtable, woundable, damageable. To be human is to not only to be vulnerable but also to feel vulnerable. In addition to humans, much that is living -- I'm not sure if all that is living -- feels vulnerable. Spirituality involves becoming more whole, more of who and what I am, and becoming more whole involves being and allowing and risking vulnerability. Being closed up and trying to prevent vulnerability gets in the way of my becoming more whole and thus gets in the way of my spirituality. Much that I have learned about myself has come as a result of being vulnerable. Some important learnings about myself that came from allowing myself to be vulnerable are that I am more okay, more powerful, more loveable than I believed. What helps me to allow myself to engage with vulnerability is knowing that I am vulnerable, knowing that there are growth and spiritual benefits from allowing vulnerability, knowing that to fight vulnerability is to fight life, knowing that being vulnerable helps me to connect with myself and others. My DNA allows me to engage with vulnerability. I was born with an "exposed" nervous system which makes me highly vulnerable! I sometimes wish I could be less so ... But there are advantages in being open to all. Empathy, compassion and a whole lot of love have stemmed from it! My antenna picks up on "signals" not all peoples do. Thankful ... In Quiet ... God's signal picked up loud and clear. The other day I made a visit to the doctor to get a referral for something minor, and when I mentioned some other more "serious" symptoms of dizziness and confusion that I had experienced about a month prior, she started suggesting a vigorous work up -- blood test, this test, that test. I walked out of there feeling overwhelmed by the possibility of going through all these tests, and walked to my car feeling very alone. I cried for a few minutes while sitting in my car, just being with the pure emotion of this feeling alone. Staying close to the raw emotion, I noticed these mind movements of defensiveness that, if followed, could have created some disruption to just experiencing the vulnerability of this feeling alone. For instance, my mind wanted to interrupt with examples and proof of how I *am* alone (which could've easily led me down a road of suffering), and even it's opposite -- examples and proof that I'm *not* alone (pushing away the feeling / talking myself out of it). I also noticed the tendency to want to hold back the tears ("staying strong"). By not following any of these tendencies, and just letting myself be completely vulnerable and present to this emotion of feeling alone, I noticed that the feeling passed after just a few minutes. It felt like something got cleaned out, that I was a little more free and present than before. And I moved on with my day. Though I haven't decided whether I'll get all these tests, I received a big gift by visiting this doctor the other day.